Happy Birthday to Glen Echo! 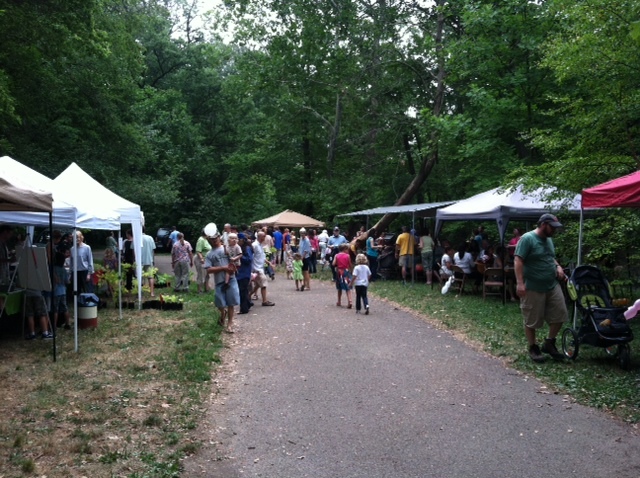 Well, if you didn’t make it to the Glen Echo birthday bash this past Saturday, you missed a wonderful party! We must have had about 200 people show up. There was face painting for kids (my favorite was a kid painted as a cow! ), a magician, White Castle hamburgers, hot dogs, and LOUA, FLOW and FOR all representing. So many people stopped by our tent – I think we had over ten new members! There was such support for all that LOUA, FLOW and FOR have done for this area. The bird mural was also dedicated and turned out even better than I could ever imagine. Jason was nice enough to record the dedication – watch the video below! I did get one mystery solved at the event. Do you remember me mentioning a small greyish bird that I saw but could never identify? Well, I saw that bird in the ravine on Saturday. This time, John was there, our expert birder. I took him to the area where I had seen the bird and, yes, you guessed it, the little guy was no where to be seen. But then, I saw him at the same time John did. A few seconds to look through the binoculars, and I was told the bird was a blue grey gnatcatcher. They are really amazing birds, hopping around on the trees then suddenly diving to the stream to catch an insect. These birds are so fast and never seem to rest for a moment. (Not to mention that they look like the models used for “Angry Birds”!) I tried unsuccessfully to find the birds myself in the lens, but by the time I focused on the place I thought the bird was, the little guy was already somewhere else. I was given a trick of sighting the bird in with my eyes then bringing the binoculars up to my eyes but no luck. I guess I need my birds to be larger and more still! Anyway, thanks to everyone who came out to the Glen Echo birthday bash. It was a blast! 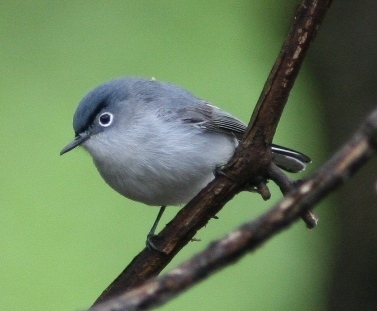 This entry was posted in Birds and Butterflies, General Information and tagged blue grey gnatcatcher, Glen Echo birthday party. Bookmark the permalink.